At Peak Potential we support leaders and high potential individuals from a variety of sectors and industries. In the last year we have worked with NHS, Public Sector, Technology, Retail, Marketing and Financial Services clients to help them achieve their career ambitions in an increasingly demanding and competitive world. Or results speak for themselves - of the 70 individuals supported last year, we helped 60% to achieve their goals in 4 sessions or less (from a programmed 8). Not only that, but 90% have gone onto experience exciting new roles, secure a promotion, or have moved from surviving to thriving in new leadership roles. At the start of her programme, Ann's main aims were to improve work/life balance, develop her leadership style and ensure her learning was sustainable after her coaching had ended. During our sessions, Ann tended to bring particular events or challenges to put under the spotlight. I had to be very flexible as the focus could be different each time. These included working through a conflict with one of the team, Ann's future career aims longer term, and how to be herself whilst taking the lead. In a nutshell we worked on helping Ann love her work again - moving from expert to leader. Ann was someone who valued deep exploration of her motivations, style and psyche. We gently explored her self-limiting beliefs and her 'imposter' which was a potential derailer as a new leader. We used situational modelling to explore relationships which she found particularly helpful as it helped to see things from a new perspective as well as 'removing the emotion' from the situation she was experiencing with individuals. Ann brought a number of conflict situations to coaching. Often this involved challenging assumptions, particularly where Ann engaged in mind reading, all or nothing thinking, and generally making assumptions about colleagues' intentions. 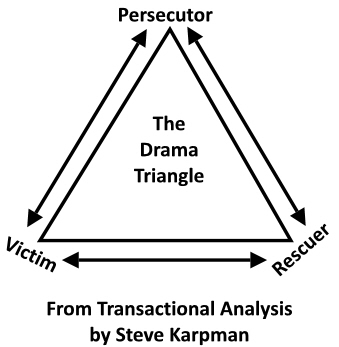 Another key tool was Karpman Drama Triangle and exploring the modes of adult, child and parent and how these modes impacted on relationships. Ann used the the models with her own team and at least two key relationships improved significantly as a result. On more than one occasion, Ann was near to tears because of her workload. I brought in paper plates and asked Ann to write on all the tasks she was spinning. The weight of those plates helped Ann to see that it wasn't feasible and enabled her to make decisions about whether to continue, delegate or stop doing certain tasks altogether. Sitting at the core of this we explored building self-esteem and self-worth, so that 'good enough' was ok and enabled Ann to let go of tasks which she didn't need to hold onto as a leader. Ann described her experience as "transformational". Working on Ann's confidence and mind-set about her own skills, strengths and value was challenging at times but lay at the crux of her achieving her objectives. Working with Jayne has been an excellent opportunity and experience! I'm also experiencing the benefits of changes I've made e.g. working relationships that continue to improve and develop. Thank you." Sue spent 20+ years working as a Director of HR Services Supply for a major International Bank. She said she felt institutionalised due to the length of service in her current role specialism. Although Sue was nearing retirement she wanted to explore alternative avenues and discover hidden or forgotten about talents to see what else might be of interest. Her aim was a portfolio or flexible retirement option. Reflecting on the outputs from the range of exercises, Sue found she wanted a non-corporate role, with total flexibility around time with a high level of autonomy. She also discovered that work/life balance and spending time with her grown up children of importance as she had not been able to devote time to them previously. She also rekindled a passion for creative endeavours. To support these new aims, we developed a functional/skills based CV which highlighted the range of talents Sue could offer a potential employer, rather than focusing on her job title and last role. Sue has embarked on a self-employed sales career which she gained through using her network. She has planned in a number of social and travel activities, as well as booked to attend pottery and art classes. Having time to explore her history, needs and aims helped Sue to feel confident about setting out on her own and enjoy her time pursuing a more flexible working life. Louise was a clinical nurse specialist in a lesser known cancer treatment service, which was also being reconfigured within a local hospital. Louise had been struggling to receive appropriate referrals and in a timely manner, which meant patients were being diagnosed later than was acceptable and Louise was spending time with the wrong patients. One of the aims of our work was to help Louise with strategies to raise the profile of her service with the appropriate personnel, so that these incidences would drop significantly; whilst not overloading Louise with extra work on top of an already exhausting workload. She had tried telling stakeholders about the service through education sessions; but this wasn't working - she was stuck. The method which worked for Louise was a creative approach whereby she drew and modelled the relationships between the various stakeholders using representative figures. This led to a 'aha' moment for Louise in terms of how distant her service was from the one on the ground. She described it as being in a bubble. Using a number of clarifying questions alongside the modelling, enabled Louise to put together a plan of action to test out new ways of working. Armed with a new perception of how the service and the relationships within it were currently working, Louise was able to put in place strategies which improved the referral process. She didn't achieve her goal overnight but ultimately she achieved a systemic change for her service. This ultimately impacted the lives of people living with a rare form of cancer. "I am now making a more conscious effort to think and reflect on why I say and do things the way I do. Sometimes a little explanation to others about my way of thinking and doing things can make everything much easier and can have an impact on future interactions." Since our programme ended Louise has been invited to the Houses of Parliament to discuss the future of cancer care with a cross section of MPs and is continuing to raise the profile of her service.